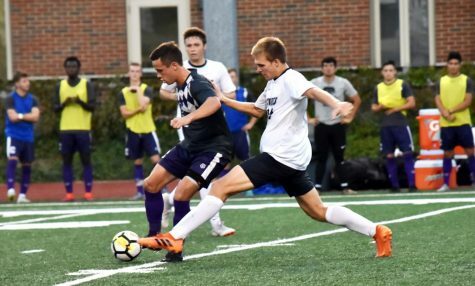 The Case Western Reserve University men’s soccer team defeated Hiram College 3-1, but dropped the first home University Athletic Association conference game against New York University (NYU), 0-3. The match against Hiram got off to a fast start with both teams immediately trading shots. 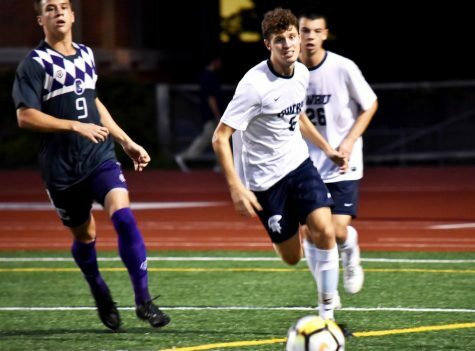 Second-year midfielder Maximilian Klemm took a shot at the 10 yard line in the first 40 seconds but was wide, while Hiram responded with their own about one minute later. The opposing goalie proceeded to save two consecutive shots, but the Spartans remained unwavered. Off a thrown ball, a good pass through two defenders found second-year midfielder Connor Weber alone on the thirty yard line. Weber took his time dribbling towards the goal and slipped a pass through two defenders to Klemm at the middle of the box. The goalie went for the tackle as Klemm snuck the ball in the bottom right corner for the first goal of the game. Five minutes later, Weber found second-year forward Seldon Magruder in the middle of the field, who hit a high shot to the right corner of the goal to extend the lead 2-0. “Connor is really flexible. 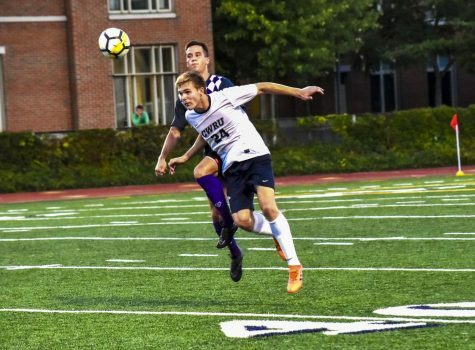 We use him side to side to switch the ball, which opens up passing lanes for the attacking forwards to receive,” said fourth-year forward Alex Besl. 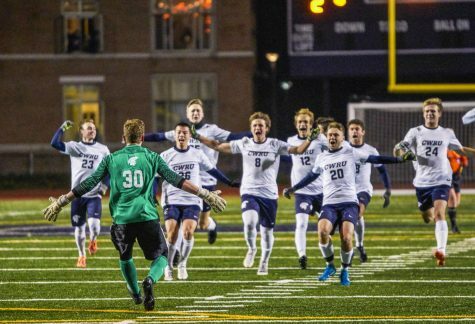 Feeling the momentum of the game, three minutes later Magruder attempted a 25 yard shot that slipped through the keeper’s hands for his second goal of the game. The Terriers were able to score during the 80th minute but were unable to comeback from the 3 point deficit. During the NYU match, the Violets came out blazing right off the bat, taking seven of the first eight shots of the game. 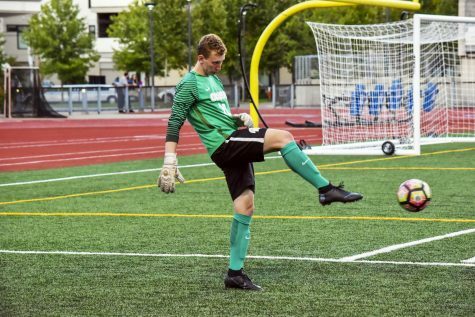 First-year goalkeeper Charlie Fink demonstrated his role as defensive anchor, recording four saves in the first thirty minutes, with back to back saves during the 26th and 27th minutes. Senft tried his nifty footwork to get by multiple defenders, but his first shot was wide and the second was blocked. The Violets broke the tie in the 34th minute from a cross into the middle of the box. As Fink tried to intercept the cross, the ball was tipped through his fingertips to the lower left side of the goal. The Spartans started to play in a more controlled pace to maintain possession of the ball, attempting three shots in the last four minutes of the first half, but the shots were either wide or stopped by the Violet’s stout defense. On their performance in the first half, Besl believed that the Spartans were dominating. “If you only watched the first half, you would believe that [we were] going to win the game,” he said. 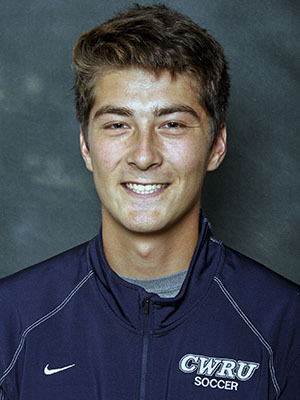 In the second half, first-year midfielder Peter Darnelle’s shot from the right corner was on target for the top left corner of the goal, but the opposing keeper managed to save it. Later, after a wide shot from Magruder, the Violets quickly pushed the ball down court and New York’s striker gathered a loose ball in the left side of the box and swiftly shot it over Fink to the lower right corner of the goal. The Spartans were unable to comeback from the 3-0 deficit. “The dagger in the second half was tough for us…but after watching the film I am not worried at all [about future games]. We just need to maintain a compact defense and have center back pressure really hard…[and] work on final moment [in games and] connecting on the pass,” Besl said. 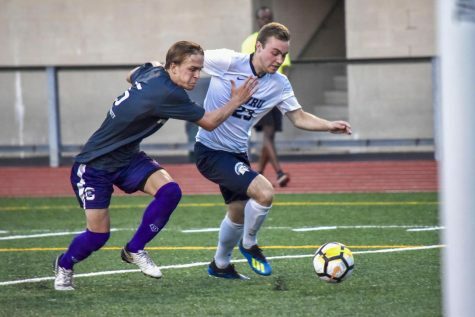 The game was extremely physical, as the Spartans picked up a total of ten fouls and the Violets had three yellow cards, but Besl said that did not affect the game. The Spartans will look to bounce back at home this weekend, as they take on Washington University of St. Louis on Friday, Oct. 12 and the University of Chicago on Sunday, Oct. 14.